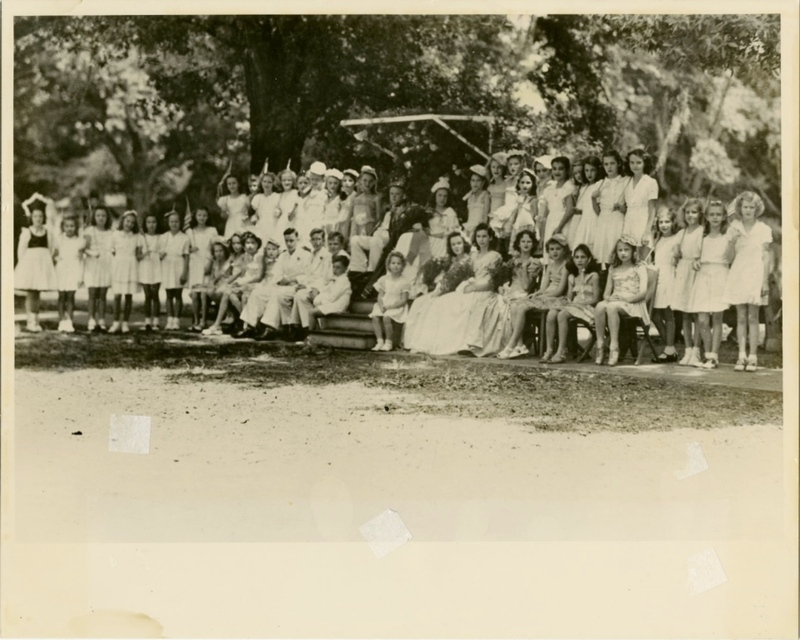 May Day Court at Sanford Grammar School during the 1945-1946 school year. Ann Whitaker and Bob Killpatrick were the May Day Queen and King, respectively. Photographed as standing in the top row, from left to right, is Eileen Barnett, Carolyn Rolland, an unidentified student, Janette Ratliff, Phyllis Shames, an unidentified student, Bob Killpatrick, Ann Whitaker, Dorris Jones, Joan Wright, Mary Ann Wilkie, Dora Lee Richardson, Beverly Benton, Mary Ann Baker, Don Bronson, Ann Robarr, Sheila Moore, and Alice Brown. Seated in the front row is an unidentified student, Linda Leonard, June Bance, Lucia Goff, two unidentified students, William "Buddy" Moore, two unidentified students, Jackie MacDonald, Jean Wilson, and Felice Smith. Original 10 x 7 inch black and white photograph: Sanford Grammar Collection, Archives Box 4B, UCF Public History Center, Sanford, Florida. Digital reproduction of original 10 x 7 inch black and white photograph. 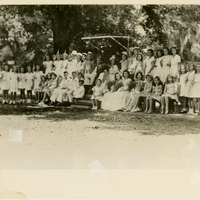 “May Day Court at Sanford Grammar School, 1945-1946 .” RICHES of Central Florida accessed April 25, 2019, https://richesmi.cah.ucf.edu/omeka/items/show/4672.